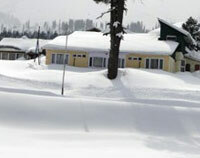 Gulmarg in the Baramulla district of Jammu and Kashmir is a famous attraction for tourists from India and abroad. The landscape of undulating mountains, scenic beauty and the flowers and trees of Gulmarg make it a picturesque place to visit a thousand times. Soothe your eyes and make your heart fill with joy as you dance with the rhythmic colour and beauty of Gulmarg. 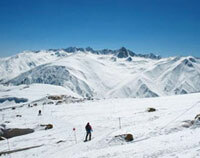 It houses many attractions in Gulmarg which are worth visiting. 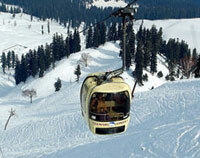 Gondola or the cable car is the major attraction of tourists of Gulmarg. 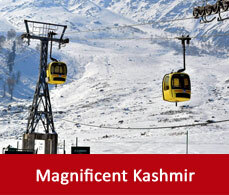 More or less every traveller who visit there has the experience of this fun filled riding of the Gulmarg cable car. 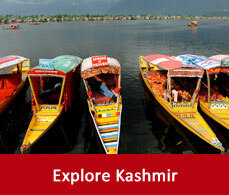 This is an initiative of the government of Jammu and Kashmir tourism. People sitting inside this cable car are travelled at an high altitude upon the valley of Gulmarg for a long distance. Then there is chair lift as well where four passengers sit inside it and have an experience of skiing in Gulmarg as these chair cars designed with skii gears and all the arrangements of skiing. In the summers and during the autumn Gulmarg becomes a land for the golf lovers. It has the largest 18 hole golf course which is famous in all over Asia. Just 4kms away from Gulmarg is a meadow from where you can have a view of the snow peaks and the chilled water of the Wular lake. Standing amidst the meadow of Khilanmarg gaze at the Himalayan range which will soothe your eyes with peace and comfort. The best time to visit the Alpather lake in Gulmarg is during Summer. The triangular shaped lake at the base of the mountain with a backdrop of the snow clad mountains, green landscape, colorful blooming flowers is a favourite picnic spot for travellers. 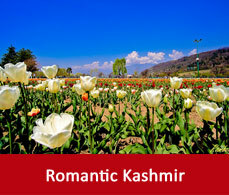 During the summer it also shares with its travellers the beauty of the valley of flower Gulmarg houses. 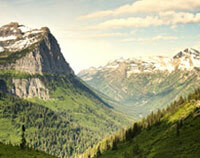 It is a long trekking trail which is 11km along the valley of Kashmir. While you travel along the path you will be reposed by the refreshing breath of the tall mines, green meadows and the beautiful landscape. 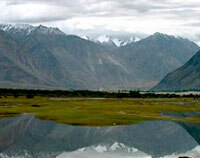 From here you can have a view of the Nanga Parbat, Haramukh and sunset peak. This stream of white pure water gets filled up by the melting of the snow of Alpathar lake and Apharwat lake. It then turns its course into the water of the river Jhelum. This mesmerising place is surrounded by the snow clad mountains, green valleys, flowers and other small lakes which makes it a dreamland which you might have dreamt of.